I can confirm this issue on Kubuntu 14.04 after installing nvidia-331. Affects me too, probably due package: nvidia-prime_0.5.3_amd64.deb. I tried to reproduce the problem but running --reinstall on the package does not modify lightdm.conf. Assuming there is no lightdm.conf in the fresh install, then the package creates a file that is reported by @Efry. what version of Xubuntu are you using? The preinstallation script checks the default login manager by looking at /etc/X11/default-display-manager. If lightdm is the default login manager, then nvidia-prime creates (if no lightdm.conf exists) or edits the configuration file. In your case it should have just edited the file by adding or replacing the display-setup-script and the display-stopped-script sections. 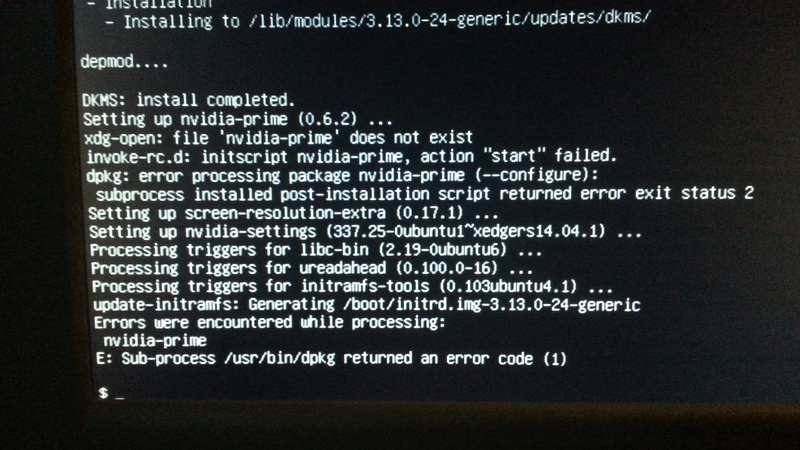 Maybe you didn't have a lightdm.conf before installing nvidia-prime? I would have had whatever I'd been left with after installing xubuntu and using the default nouveau. I'd assume that includes a lightdm.conf file. After installing nvidia I then had to edit lightdm.conf to not assume I was using Ubuntu. seems not if a vm is anything to go by. Ok, then I guess I'll have to find a more reliable way to tell what system I'm dealing with. I'll use both Kubuntu and Xubunutu vms so that I can see exactly how I can better detect the system in use. @alberto - I installed lubuntu - same issue there. The unadulterated lightdm.conf from that install is the same. * Do not touch lightdm.conf any more on anything newer than Precise. templates have clearer names now. * Clean up the old 90-nvidia.conf that we used to ship in /etc. I just experienced this bug on an upgrade from Xubuntu 13.10 to 14.04 with the proprietary Nvidia drivers. /etc/lightdm/lightdm.conf had both greeter-session and user-session defined as 'null' (user-session=). Manually setting the right values fixed the issue. I hit this bug again with a Xubuntu 12.04 to 14.04 upgrade. Seems likely it is actually caused by the lack of xubuntu-default-settings installed than nvidia-* packages. Will get more people look at it. Alberto Milone, i'm pretty sure that instead of generating lightdm.conf, additional snippets should be added to /etc/lightdm/lightdm.conf.d/ with just display-setup-script and display-stopped-script stanzas. # *** more detail not investigated! # NOTE: I do NOT se the login prompt unless this is in place! # USE recovery mode boot -> 'root prompt' on fsck'ed filesystems to get it in place. Commands to install the OEM-driver. "sudo apt-get install nvidia-settings-319 nvidia-settings-319-updates"
Ouch what a mess, is there a &lt;PRE&gt; - thingy here? Display at the end of it. Alberto, what kind of information you would need to get this bug from Incomplete to Confirmed/Triaged? @Hannu: please do not recommend installing the nvidia driver using the nvidia installer, as that will likely make your system unusable.